During the short time she has been in the United States, she has had several exhibitions including two person and group exhibitions at the Beachwood Community Art Center and Cuyahoga Community College, both in Cleveland, Ohio. She was accepted to lot of the International Art Exhibition in the United States. Recently, she had her solo exhibition at the Waterloo Art gallery in Cleveland. Ms. Roh continues to work diligently on her paintings, creating new work and furthering her vision as an artist. Roh has received awards including the Korea Creation Culture Art Award in Seoul, the Grand Art Exhibition of Korea in the National Modern Art Museum in Seoul, World Peace Art Exhibition in the Danwon Museum, Ansan, Korea, and Korea Fine Art Concours for Peace Kyungbokung Metro Museum and Ad Culture Center both Seoul, Korea. 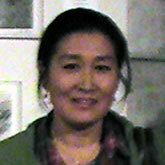 She is currently a member of the National Association of Art in Korea, and SCAI, Spring Creation art of Institute. In America, Fine Art America and the National Association of Independent Artists. She also became an Operation Committee Member of Foreign Exchange artists Association in Seoul, Korea. I am a Korean painter who lives and works in Cleveland, Ohio. My paintings are influenced by social complexities of the urban spaces in which we live. By focusing on these types of spaces, I work to express feelings that are solemn and bleak, yet somehow splendid. My work expresses the complexities of urban space, using the entire canvas to display these scenes in the second dimension. In addition, expanded second level dimensions and simple color are used to express my artistic intentions. My works are based on unique methods that construct spaces in accordance with the artist’s invisible sensational order, which comes from inside. They are common spaces that we have frequently seen around. Yet, when I give attention to them and convert them into images as entities, it may be said to constitute ‘the true attraction and human’s capability of painting’. From now on, my sources will be inexhaustible, and those meanings will take on specialness in my sentiments, instincts, and emotions. Namely, it is about merging the familiar subject matters from our everyday life with the Korean style and East Asian beauty, concentrating finding the values, and transferring them onto the canvas. My works were based on my design background such as high contrast images with strong colors, simplified shapes with text. My art work often employs the ‘Ohbangsaek’ colors which are traditional Korean color schemes of red, blue, yellow, white, and black. It is related to Korean emotion and environment and forms Korean traditional beauty. Namely, it is a simple and strong color sensation. These colors can be found on Korean yin-yang symbol, dancheong, and traditional clothing with multicolored stripes. I paint using oil and acrylic working the paint onto the canvas until the desired color appears. Such colors, composition of geometry, and detailed structures organized and formd my complete art work. There is a peculiar beauty in the canvas. I continue to work on my paintings, creating new work and furthering my artistic vision as a contemporary artist. My artistic style and work’s world are models in this global period of 21st century. Speedily changing, the expression of the theme of a symbol and an image is the expression of our time.